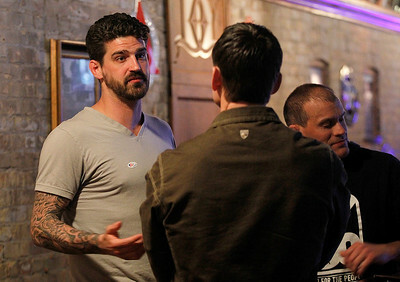 Matthew Apgar - mapgar@shawmedia.com Woodstock city council candidate Daniel Hart, left, talks with supporters as he awaits election results on Tuesday, April 7, 2015 at DC Cobb in Woodstock. 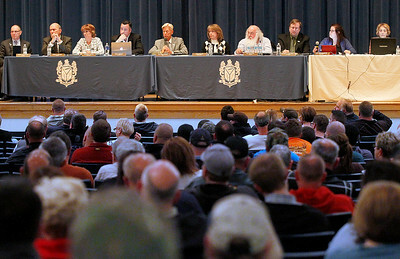 Matthew Apgar - mapgar@shawmedia.com City council members address questions on Tuesday, April 7, 2015 at Woodstock High School in Woodstock. 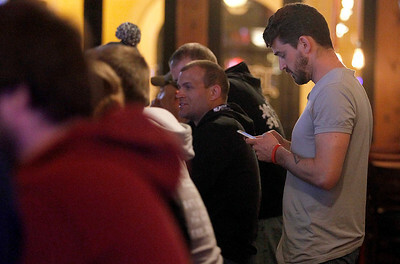 Matthew Apgar - mapgar@shawmedia.com Woodstock city council candidate Daniel Hart, right, checks election results on his cell phone on Tuesday, April 7, 2015 at DC Cobb in Woodstock. City council members address questions on Tuesday, April 7, 2015 at Woodstock High School in Woodstock.